The 2017 hurricane season will go on record as one of the most active and devastating in recent history, yet people are far better prepared today thanks in large part to better predictions. FIU researchers think the science of storm forecasting can be even better. 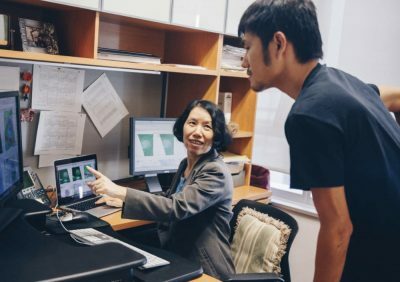 FIU researchers and students are investigating new methods to further increase the amount of time people have to get out of harm’s way. They are developing new modeling techniques and searching for signals embedded within storms that could offer clues to a hurricane’s path, projected intensity and probable impacts. There’s only one problem—rapid intensification is unpredictable. FIU meteorologist Haiyan Jiang hopes to change that. Using passive microwave satellite observations, Jiang has developed an algorithm that can help predict the onset of rapid intensification of major storms. Forecasters at the National Hurricane Center and the Navy’s Joint Typhoon Warning Center are now using her data throughout the hurricane and typhoon seasons to improve storm modeling. Jiang’s former student Brad Klotz, who earned his Ph.D. from FIU in 2017, is in search of the strongest winds in hurricanes. As a Ph.D. student, he studied how ocean surface winds interact with characteristics of hurricanes including strength and speed. If forecasters can use surface winds to help identify the location of the strongest winds in a storm, they may be able to better predict the location of the most devastating landfall impacts. In addition to better forecasting before a storm, this information could also help map out recovery efforts well before damage has even occurred. As a meteorologist with the National Oceanic and Atmospheric Administration’s National Hurricane Center, Klotz is continuing his research. Storm surge is another issue. Coastal communities and island nations are highly vulnerable to the surge often created before, during and after tropical storms and hurricanes. The impacts can be deadly. Better predictions can save lives. Researchers from FIU’s Extreme Events Institute are working with the National Hurricane Center to develop a storm surge database for Haiti and the Dominican Republic. Led by Earth and Environment researcher Keqi Zhang, their efforts are improving storm surge forecasting for the shared island of Hispaniola. The information could help local governments make more informed decisions when hurricanes approach, including when to evacuate. With most natural disasters, nature is rarely the problem. The devastation is caused by people living in the direct path of nature. Ignoring potential disasters until they are a clear threat to people is no longer an option, according to geologist José F. Longoria, who researches earthquakes, volcanic hazards and floods. Educating people about their vulnerabilities as early as elementary school, he said, will help them better understand the actions that must be taken to mitigate disasters. But FIU is talking about it. Talking about it and trying to do something about it. Before 1992’s Hurricane Andrew, the university did not offer a class focused solely on disasters. Today, there are more than 25 and the Extreme Events Institute and Sea Level Solutions Center are leading research and community outreach programs to prepare Florida for the challenges ahead.